Coral reefs smell of rotting flesh as they bleach. The riot of colors—yellow, violet, cerulean—fades to ghostly white as the corals’ flesh goes translucent and falls off, leaving their skeletons underneath fuzzy with cobweb-like algae. Corals live in symbiosis with a type of algae. During the day, the algae photosynthesize and pass food to the coral host. During the night, the coral polyps extend their tentacles and catch passing food. Just 1 °C of ocean warming can break down this coral-algae relationship. The stressed corals expel the algae, and after repeated or prolonged episodes of such bleaching, they can die from heat stress, starve without the algae feeding them, or become more susceptible to disease. Coral reefs are not just about colorful fish and exotic species. Reefs protect coasts from storms; without them, waves reaching some Pacific islands would be twice as tall. Over 500 million people depend on reef ecosystems for food and livelihoods. Even if the temperature increase eventually stabilizes at 1.5 °C a century or two from now, it’s not known how well coral reef ecosystems will survive a temporary overshoot to higher temperatures. The corals are like the canary in the coal mine. 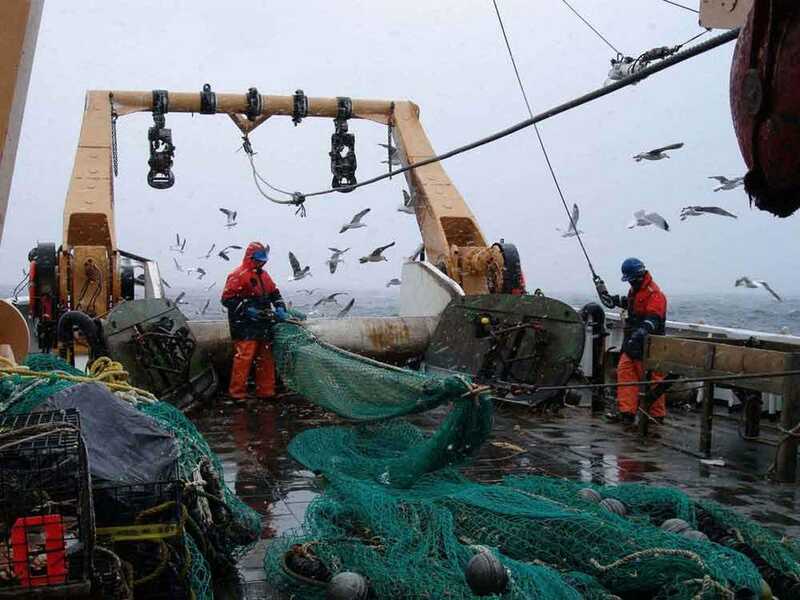 Note: The authors are Puget Sound-based fishermen, marine suppliers, and policy leaders (including National Fisheries Conservation Center’s Executive Director, Brad Warren). Ocean and coastal waters around the world are beginning to tell a disturbing story. The seas, like a sponge, are absorbing increasing amounts of carbon dioxide from the atmosphere, so much so that the chemical balance of our oceans and coastal waters is changing and a growing threat to marine ecosystems. Over the past 200 years, the world’s seas have absorbed more than 150 billion metric tons of carbon from human activities. Currently, that’s a worldwide average of 15 pounds per person a week, enough to fill a coal train long enough to encircle the equator 13 times every year. Aquaculture experts from the United States and New Zealand are meeting in Nelson to focus on protecting the $350 million industry in New Zealand from harmful ocean acidification. About 60 shellfish experts will share knowledge at the workshop on Tuesday and Wednesday. Ocean acidification is the progressive increase in the acidity of the ocean, which caused a dramatic decline in Pacific oyster larvae in the United States in 2007. It is not a problem in New Zealand currently, but it is important ocean monitoring systems are in place to enable the government to track future changes in ocean chemistry, the Ministry for Primary Industries says. “There are key lessons to be learned from our colleagues in the United States that will assist us in focusing research, planning and management practices to enable the industry to grow despite pH decline,” Cawthron Institute aquaculture scientist Dr Norman Ragg says. The New Zealand aquaculture industry is worth $350m a year. PMEL successfully deployed the first carbon dioxide flux and ocean acidification mooring in the Northern Indian Ocean on November 23. The Bay of Bengal Ocean Acidification (BOBOA) mooring will help us understand the large intraseasonal, seasonal and interannual biogeochemical variations in the Bay of Bengal, and how the marine ecosystem in the Bay is changing over time. This mooring is part of the Research Moored Array for African-Asian-Australian Monsoon Analysis and Prediction (RAMA) made possible through a close partnership with NOAA and Bay of Bengal partners. Read more and see live data on the BOBOA Carbon website. The two-day conference brought together more than 60 shellfish experts to share their knowledge in order to help identify ways to protect New Zealand’s NZ$ 350 million (US$ 285 million) per year aquaculture industry from the effects of climate change. The agenda was organized around two topics identified as top priorities during the 2012 session of the N.Z.-U.S. Joint Commission on Science and Technology Cooperation – (1) Climate Change Monitoring, Research, and Services in the Pacific, and (2) Marine and Ocean Research. Coral reefs are particularly sensitive to acidification. Just as climate change has evolved from a purely scientific discussion into a set of significant economic and security concerns, ocean acidification has quickly evolved from a theoretical exercise into a major economic threat. Just looking at the United States, for example, one of every six jobs is marine-related, and more than one-third of the Gross National Product originates in coastal areas.